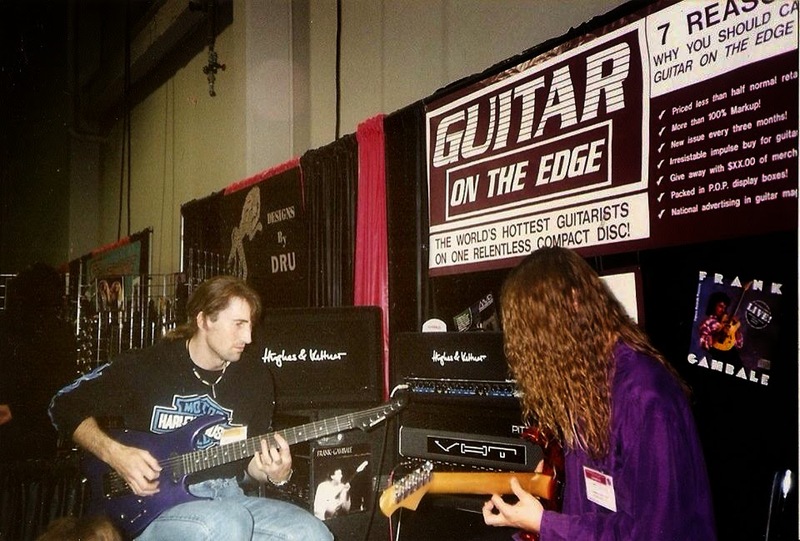 In the late 1980's and early 1990's the initial wave of guitar players let loose by Mike Varney and his world renowned Shrapnel Records had progressed to more major labels or joined recognised bands like Dave Lee Roth, Mr Big, Megadeth, Alice Cooper. Mike embarked on filling out the next wave with talented players like Todd Duane, Scott Stine, Brett Stine, Derek Taylor and Ron Thal. Meanwhile Mike's brother, also a keen guitar fan, set up a new fusion guitar label, Legato Records, and a new concept label, Guitar On The Edge, a regularly released CD featuring the sizzling hot demo tracks or underground players that were floating around the guitar underground in the pre-internet underground. 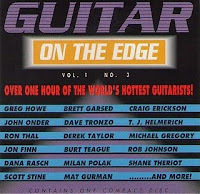 Like Mike, Mark's label released a host of well received CD's that included players like, Allan Holdsworth, Frank Gambale, TJ Helmerich, Brett Garsed and Shawn Lane, in addition to other rising stars like Richie Hallebeek, Anti Kotikoski, Dave Martone, Guthrie Govan, Derryl Gabel and Scott Mishoe. The label ran for a number of years and then like all good things it came to an end. 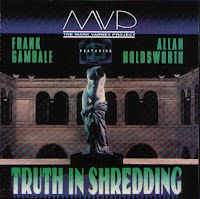 With the birth of the internet and latterly YouTube, we are now able to assemble the same sort of concept as GOTE and for me this is one of the reasons I decided to work on the blog, Truth In Shredding, titled after the Legato release, Truth In Shredding, which featured towering fusion giants Frank Gambale and Allan Holdsworth. 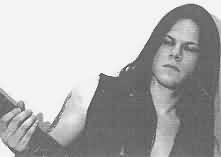 So it was great for me to spot that Mark Varney had surfaced again on Facebook and so I took the opportunity to catch up with Mark and ask him a few questions about the history of the Legato label and his future plans. [Truth In Shredding] From outward appearances it would seem that Mike Varney and Mark Varney were cut from the same intense guitar block. Did this manifest itself in similar record collections, fighting over the latest player or did you like different styles? 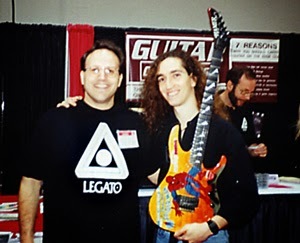 [Mark Varney] I think the love of hot guitar must have been in our genes. I am six years older than Mike and entered the guitar scene while in high school when my friends and I discovered Hendrix and Cream. But Mike was right there with us and soon after began learning to play the guitar. It just kind of snowballed from there. Back then, there were places you could get promos, so Mike and I would turn each other on to the latest unknown guitar phenoms which, between 1970-73, included Gary Moore/Skid Row, Rory Gallagher/Taste, Ollie Halsall/Patto, Allan Holdsworth/Tempest & Iggenbottom's Wrench, and Jan Akkerman/Focus. I don't remember too much fighting over LPs but there were trades. 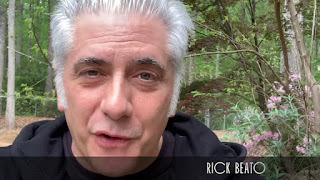 [Truth In Shredding] I think my desire for listening to guitar came from hearing players like Richie Blackmore in Deep Purple, Steve Howe in Yes and Gary Moore Colosseum II, later Alex Lifeson in Rush. In fact I recall driving around the countryside with my mate in his car, with his new 8 track, with Gary Moore blaring out The Inquisition live, windows down, sound up... but I digress! [Mark Varney] I remember playing tennis with Mike for the first “Sky” record with Doug Fieger who went on to found The Knack. But we were not just into heavy guitar back then. We were into all sorts of experimental prog rock bands. I'd have to say that we pretty much had the same diverse tastes. I went on to U.C. Berkeley and continued collecting there and Mike, who lived in Marin County, would take the bus to Mill Valley, San Francisco and Berkeley to add to his collection. [Truth In Shredding] With your undoubted fascination with music, were you a musical family and did you play an instrument or get any formal musical training or lessons? [Mark Varney] My mother played the piano and sang. Both Mike and I had some piano lessons. Mike had some drums early on that he taught himself to play, followed soon after by guitar and bass. I taught myself to play guitar and bass a little in college but Mike was a truly gifted musician at a young age. I used my musical knowledge to write many songs, most of which I used in the classroom in my education work in the public schools. [Truth In Shredding] With all that music around you do you still play guitar now and what is your current favourite model? [Mark Varney] I rarely pick it up today except for when I'm writing a song. My favorite electric is a "The Paul," mainly because I never invested in a really good guitar. Nowadays I tend to write my music on guitar and produce it with midi on my computer. [Truth In Shredding] It's good to hear that you are still creating new music. I understand that Mike Varney's heavy involvement in the Bay area music scene exposed him to many groups/musicians and piqued his interest to start a label. How did your desire to create a record label come about? [Mark Varney] I owned a record store for a time and it seemed a natural progression. I'm sure Mike's success in the music industry was also a contributing factor. Also, Holdsworth had been my favorite guitarist for eons and no one was finding the next Allan. So when I sent my press kits out to the guitar magazines, I announced that I was looking for "the world's best unsigned fusion guitarist." In hindsight, Frank definitely fit the bill at the time. About the time Allan and Frank recorded TIS, they both won the Guitar Player reader's poll in the same year, Allan for best guitar synthesist, and Frank for best fusion guitarist. 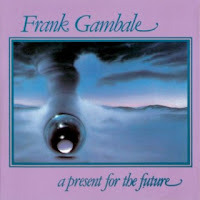 [Truth In Shredding] You signed Frank Gambale for a three album deal, how did that come about? [Mark Varney] Frank was pretty unknown at the time and I was shelling out some significant cash to promote him. We decided that less than three wouldn't have been fair to me but more than three wouldn't have been fair to him. 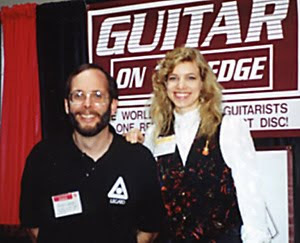 After the initial success with Frank, I recall reading Guitar World magazine and seeing the early adverts for Guitar On The Edge (aka GOTE) and being really excited about being able to get hold of CD quality versions of tracks that were running around the underground guitar scene. I immediately got my dollars and ordered my subscription. 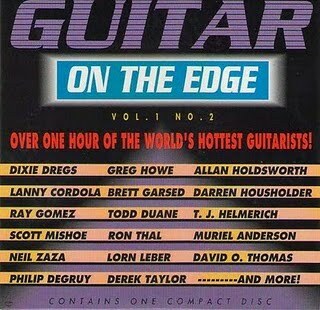 What gave you the idea to start the CD series Guitar On the Edge? [Truth In Shredding] It sounds like a sure fire success, I heard you were receiving five or six demo tapes a day from players who'd would like a slice of the action. Is that correct? [Mark Varney] On some days, maybe. But I would think the average was somewhat lower. Can't remember for sure. I do remember that I had to wade through a lot of sludge to get to the gems. My advice to young players who are sending their stuff out to producers, is to put the song that is most likely to turn their heads first on the demo. That might mean a different song order for each producer. I must admit, with so many demos, if the player didn't reach out of the cassette player and grab me around the neck with the first tune, I may not have gone on to hear the rest of the demo. [Truth In Shredding] The fact that a relative few guitar shops got involved was a real shame as I used to look forward to my regular dose of guitar fusion, crack open a few beers with my mate and listen in awe. You also started working with Guitar Techniques in the UK. Guitar Techniques is a well respected guitar magazine and it was great to hear lessons from people like Bill Ruppert and Scott Mishoe... I still have copies of those, and I particularly like Bill's Mission at Orange solo breakdown and Scott's hyper lesson. How did that come about, plus did you complete a CD with Bill? 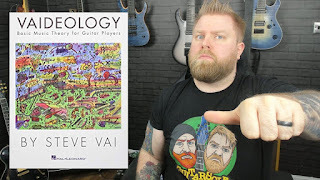 [Mark Varney] The Guitar Techniques episode was quite enjoyable. I had this idea that guitarists I knew could provide the magazine with exciting lessons, and the magazine, in return, would provide the guitarists with much-needed exposure. I worked a barter deal wherein I wouldn't be paid anything for my contributions, but the guitarists would receive a nominal amount and Legato would receive a full color ad in each issue. The ad was designed by Andrew Brel, who was taking care of some sales for Guitar Techniques and he actually distributed the Legato CDs in Great Britain for me. I got to know Phil Hilborne pretty well at that time as he served as editor for the GOTE lessons. Both Andrew and Phil are super human beings and I am grateful to be recently back in touch with both of them after a long hiatus. 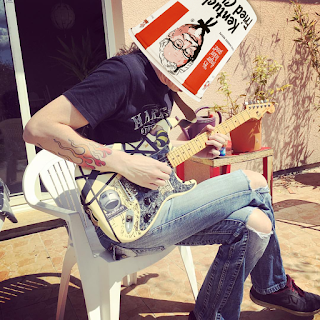 [Truth In Shredding] Yes, Phil Hilborne's super well-known for his guitar tutor and hard work, and we've been in correspondence about things guitar related... again I digress... do go on! [Mark Varney] As for Bill Ruppert, I first heard him on the Software fusion CD, "Marbles," which had some incredible legato-style playing. [Truth In Shredding] I must look that one out since I really like Bill's tracks...great slabs of legato fusion and tasty acoustic too. I hope that Bill's CD's still available! I also understand that Milan Polak was featured heavily on the GOTE releases. Milan and I have recently been working on some guitar competition projects. In terms of GOTE what was Milan's role? [Mark Varney] Milan was my anchorman on Guitar On The Edge. What that means is that song sequence was very important to me and it was essential to have a killer track at the end to leave them panting and craving more! Sort of like the old action serials like Superman and Flash Gordon where things would get very exciting and then that would be it until the next episode. So, to that end, it was a nobrainer to put Milan's stuff at the end. His compositions were always pulse-poundingly exciting and his solos breathed fire. I had the pleasure of hearing him in a shred trio with Joel Rivard a few years back and I was pleased to note that he had become an even bigger monster!! Quick, call out the army before he attacks again!!! [Truth In Shredding] Milan certainly knows how to burn you can check out his youtube channel ! Bill Ruppert won the other hand was a more fusion orientated guy, how did he get involved in the GOTE series? [Mark Varney] In the mid '80s, Bill was the most in demand jingle guitarist in Chicago, and I have fond memories of he and I having dinner, then going to Pierce Arrow Studios where he cut an acoustic demo expressly for me. He spent a year attempting to rearrange his schedule to make time for recording a CD, but, alas, it never came to pass and then I found Frank. 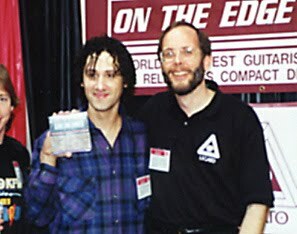 Bill is a great guy who, if memory services me correctly, invented and built the first guitar emulator. I am glad to see that he is still making awesome sounds on the guitar!! By the way, I'd like to credit Craig Stuart Garfinkle for getting me in touch with Frank. 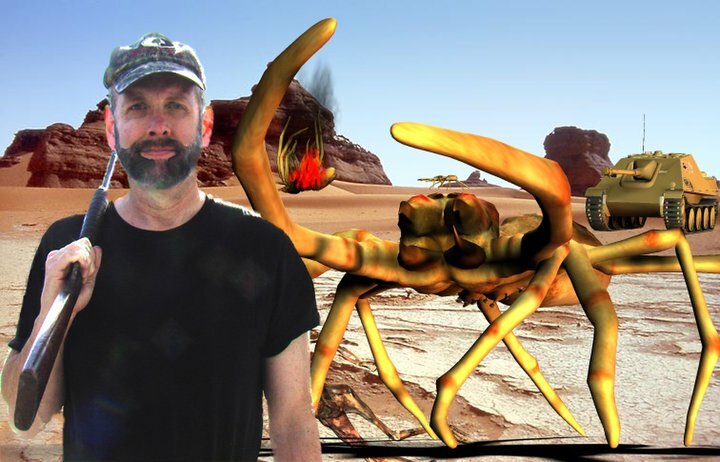 Craig is a gifted guitarist who is one of the most indemand videogame composers in the world. When I received Frank's demo, I believe I listened to it all the way through about ten times in a row! I think his genius is pretty much taken for granted these days, as is Allan's, but you can imagine what it would have been like hearing Frank for the first time back in 1985! [Truth In Shredding] Absolutely... Frank really brought sweep picking into the world, but in a cool fusion context. 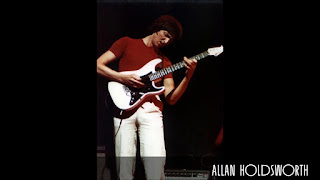 I must admit I didn't get Allan Holdsworth first up, then one day I was listening to Nevermore, from UK and it all clicked... after that point I think I bought the entire back catalogue... it actually helped me to listen to more forms of music, opened my ears. The concept of the MVP albums was also new, getting backing musicians in and getting monster players to solo on the prepared tracks was a great idea. 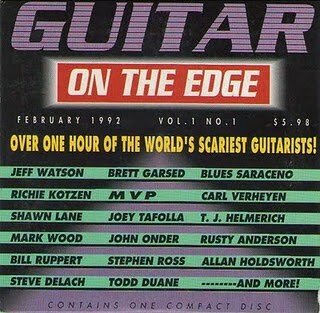 For me these releases are must-have CD's featuring players such as Allan Holdsworth, Frank Gambale, Brett Garsed and Shawn Lane. How difficult was that to organise and how were they assembled? [Mark Varney] Well, these players were no-brainers, the absolute best of the best. The only other player that I may have considered at the time, was Greg Howe, and he was signed to Shrapnel. And, yeah, it took a lot of selling and footwork to put the projects together. Frank and I were in touch a lot at the time since I put out his first three solo projects. And we both enjoyed Frank's live effort as it gave him license to rip people's heads off like he did in his concerts, without worrying about airplay on jazz stations which, I think, has prevented many a strong player on studio recordings from really letting loose. When I approached Frank with the MVP concept and asked him if he would do it if I could bring Allan on board, he jumped at the chance, especially since I let him pretty much choose his favorite fusion tracks and players he was comfortable with. I was fortunate that I didn't have to do much convincing of Allan since, for the most part, he liked the tunes and respected Frank's playing. To this day, I believe both count TIS as one of their favorite projects. [Truth In Shredding] you got that right! 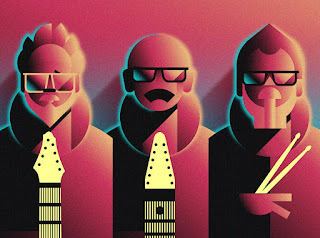 [Mark Varney] Centrifugal Funk was born out of me seeing Allan play in a funk band with the likes of Stanley Clarke, Freddy Hubbard, George Duke and Michael Brecker. Allan sounded great in that context, and there had never been a funk-shred CD. 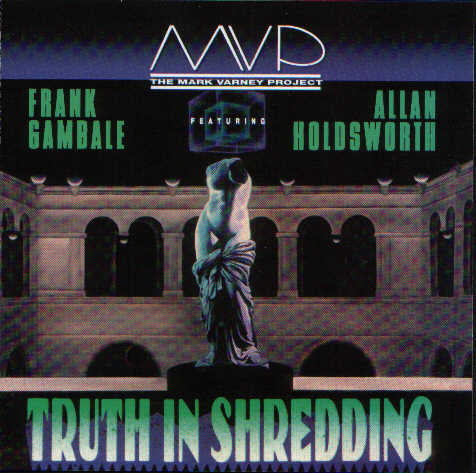 [Truth In Shredding] That sounds awesome, you're right about that, a CD with Stanley Clarke and Allan funking it up would have been fantastic. [Mark Varney] However, he really wasn't interested in doing a project like that so politely declined which opened the door for me to ask Brett, who had recently moved to the L.A. area, and whom I had known and admired for quite some time, and Shawn Lane, who, up to that point, hadn't done a full-on overthetop CD, though he was already legendary due to the many live bootlegs floating around. Like everyone associated with these projects, Shawn was a super nice guy but was involved in his own projects and I eventually found it necessary to fly to Memphis, where he lived, to tape his performances. [Truth In Shredding] I was lucky enough to catch up with Shawn in the UK and, like you said, a super nice guy. He invited myself and Matt Williams from Liquid Note records, out for a curry after his performance. 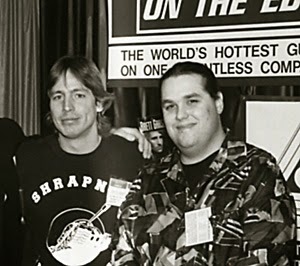 I think the Shawn Lane connection makes the 'Centrifugal Funk' release a very special CD for me. I had wanted to hear Shawn ripping some wide interval licks after hearing some live tapes and the Mark Varney Project 'Centrifugal Funk' project certainly delivered what I wanted to hear. 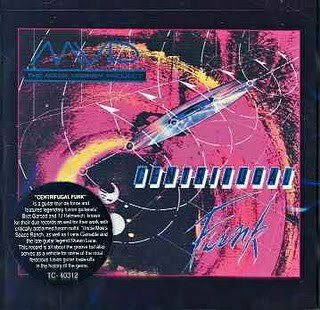 How did the 'Centrifugal Funk' CD come about and how did you decide which players to get on the album? [Truth In Shredding] Absolutely, the main highlight for me on 'Centrifugal Funk' was capturing Shawn Lane in full flow during for the Hey T Bone solo... amazing... although I understand from Richie Hallebeek's interview with Shawn Lane, he himself was less enamoured with the mix and the inclusion of "Lanes Blitz" on that CD. Were you happy with the final sound and composition of that release? [Mark Varney] In hindsight, the mix could probably have been a bit better. We worked hard on the snare but it was sonically a little too prominent. As for Shawn's freeform solo, I asked Shawn to do it and, to that end, he did three or four punch-ins until he had it the way he wanted it. He actually supervised the punch-in mix. I know Shawn has been quoted as saying that solo was just a warm-up but that just wasn't so. It was a long time ago, and I'd like to think he just forgot. But, regardless of C-Funk's shortcomings, it is what it is and it pretty much captured what Jimmy and I set out to do. It was a pioneering effort, to be sure, and many find it more enjoyable than TIS. [Truth In Shredding] It worked for me and I love the idea of fluid guitar playing over a funk beat. Indeed I recall trying to buy some huge speakers, going to the listening room in a shop, putting on, So What and Hey T Bone from 'Centrifugal Funk', at high volume, and watching the sales guy look at me as if to say who the hell was that... I was right, as he asked me where he could get a copy. As you say, it's a real shame that Allan Holdsworth did not sign up for that release, as he could have added a massive new dimension! Were there any plans at the time to do more MVP releases right after Centrifugal Funk? [Mark Varney] Money was the limiting factor back then. C-Funk cost almost $30,000, 20 years ago which, in today's dollars would be more like double that. [Truth In Shredding] Wow that's amazing, I hadn't realised how much it had cost to produce, but it explains why it sounded so good to me! [Truth In Shredding] Guthrie Govan commented that in his work for the Legato record label the important aspect was less the composition, and more about the incredible soloing. He paraphrased it by saying "Oh don't worry about the compositions – the people who buy our records just want to hear loads of burning guitar". 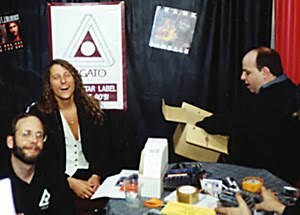 Now it seems to me that the Legato label releases were more a good mix of music and legato fusion chops. What is your view of the material released on the Legato label? [Mark Varney] Well, your view is correct, and thanks for recognizing the quality of the compositions. But I can understand why he may have interpreted my comments that way. What I was trying to get across to the GOTE guitarists, was not to hold back but to let er rip in the solos. Quite frankly, if a GOTE composition didn't measure up, I would reject it out of hand. A CD full of shredding over lousy tunes is generally pretty unlistenable. Having said that, the solos definitely had to be cutting edge. [Truth In Shredding] LOL... that is a formula that I can align too! 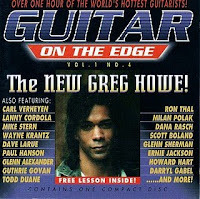 It seems strange that Guthrie Govan's track, "Waves" was on GOTE volume 4, back in 1993 and yet he didn't get around to a full release of that track on his first solo CD until August 2006. Do you have any tracks left over from all those session that could be released now, including players that weren't featured before as well? [Mark Varney] I had an unreleased GOTE 6 on a backburner at the time I got out of the biz. I wish I still had all those DATs but they are long gone after many subsequent moves. However, one of the most exciting tracks would have been, Applehead, by Mike Grange, who Steve Tavaglione turned me on to. Mike was an incredible fusion guitarist who totally flew under the radar, largely, I think, because he had a high dollar career in another industry and he had to divide his time between both careers. I noted that in the late 90s, he recorded a second CD to followup his brilliant first one and it had Applehead on it. If anyone knows whatever happened to Mike or whether or not he is still playing, please contact me at my Facebook account. [Truth In Shredding] I'll do some digging around for you Mike... I'll also look for those CD's too! 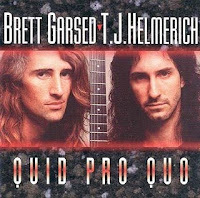 Brett Garsed and TJ Helmerich were a great combination also, releasing Quid Pro Quo and Exempt on the Legato label. Did you put the pairing together or did they come to you with a proposal? [Mark Varney] I had been a great admirer of Brett's for some time. He and I had plans to release a solo project, but, since he and TJ were pretty much joined at the hip and both brought something unique to the table, it made sense to record the duo. Also, TJ brought brought with him some rather impressive engineering chops which allowed us to record a big sounding CD on a shoe string budget. I am quite proud of both G and H CD's!! 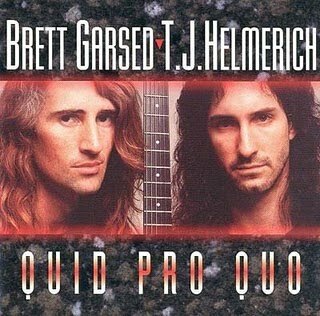 [Truth In Shredding] I think most players I know were blown away by those guys whether hybrid picked legato solos of Brett Garsed or the super tapped legato solos of TJ Hemerich. 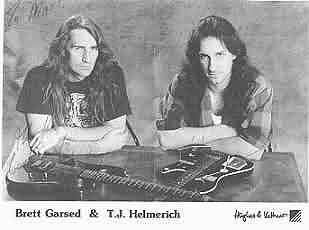 TJ was just amazing and I recall hearing Horizon Dream on GOTE volume 1... I was just blown away... 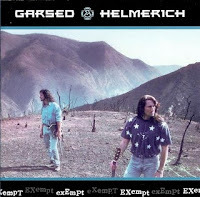 I was just waiting for you to release a TJ Helmerich CD. Was that option ever on the cards? [Mark Varney] I don't think so because they really preferred to record together. [Truth In Shredding] You had a lot of great records out. I know which ones I liked the most; however, ultimately, what was the best selling Legato record and was it a surprise to you? [Mark Varney] After all these years, I am not really sure. Truth In Shredding was number one on the Japanese Swing Journal Contemporary Jazz chart and was one of the best sellers. 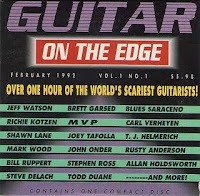 [Truth In Shredding] No surprise for me there, but Holdsworth and Gambale were on fire on that release... You really made history with that one... now If Mark Varney got access to a time machine, would you go back in time and run Legato again or would you do something different, are there any players that you wished you had recorded? [Mark Varney] Funny that you said I made history with TIS. I thought I had too. 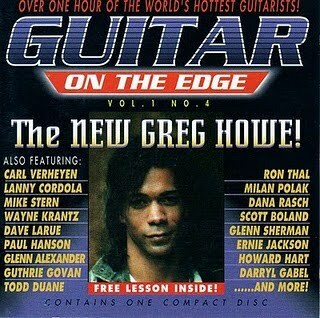 However, the guitar magazines all sort of conspired against the CD. I thought for sure, Frank and Allan would have appeared on the cover of at least one of them, and though I did much canvassing to that end, I was ultimately unsuccessful. Other than a few obligatory reviews, we didn't even land an article! The fact that Allan recorded his solos in his own studio seemed to really put the magazines off, which is tragic, but laughable since it was a studio album and was tracked much more live than most. In hindsight, I wouldn't have lied about it, but would have left that information off the CD and let the recording stand on its own, rather formidable performances. As for guitarists I wish I'd recorded, these would have to include Joe Satriani, Jeff Beck, Gary Moore, Allan Holdsworth, Eric Johnson and Eric Clapton. That would have generated enough cash to enable me to put out more noncommercial projects with relatively unknown monsters like Scott Mishoe. I wish I could have done more with Shawn, who I continue to greatly admire and, if Greg Howe hadn't already been signed to Shrapnel, I would have hoped we could have collaborated. It was an honour to have him on the cover of one of the GOTE's. If I had started Legato in the 70s, it would have been fun to have Ollie Halsall, Allan Holdsworth and Gary Moore on a rock fusion LP! Have you heard that tune, “Killer,” by Cozy Powell? Gary and Don Airey totally tore that one apart! I still love listening to that today!!! [Truth In Shredding] Yes, great track. I've heard that one, and of course I really loved Gary Moore and Don Airey with John Hiseman with Colosseum II. Plus an MVP release with those guys would have been awesome too! Greg Howe did go in a more fusion direction and would have made a great MVP artist. Rumour has it that you were instrumental in the naming of the Greg Howe album, Extraction, for the Shrapnel label, is that correct? [Mark Varney] This is the first I've heard of it. I had heard he came up with the name after a trip to the dentist...not really. But all kidding aside, what is the story you heard? 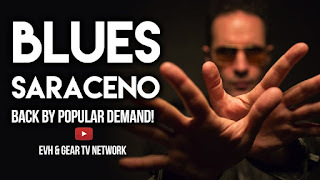 [Truth In Shredding] Super guitar fan, Guglielmo Malusardi, did an interview with Greg Howe for guitar9. Guglielmo had heard that Greg's release entitled, "Extraction" had a very long and troubling recording process. Greg Howe had said "Yeah, it really was! Originally the album title was going to be "Pulling Teeth", and it just happened that the picture that was ultimately the Extraction cover was going to be used for the album cover of another band. Then they didn't use it and Mark Varney sent me the picture asking, 'Do you like this?' And I told him that there was something true about it. I related to the picture because it was the most difficult album that I've ever done." [Mark Varney] I totally believe Greg and wish I could see that picture. I wonder, though, if maybe Mike was the one who sent it and the interviewer just mixed up the names? As you can imagine, with Mike and Mark being such similar names, he and I have often been credited with the other's work. [Truth In Shredding] Your might be right as it seems that Mike and Mark are often incorrectly attributed in many of the things I have read. If you were stranded on a desert island, what would you take as your five most indispensable instrumental CD’s to listen to? [Truth In Shredding] LOL... you have a good point there... you'd have to pick wisely to ensure the pain threshold was not breached too early... Seriously though, I think I was just alluding to what you might think were the top 5 albums of all time... I am assuming more Allan Holdsworth than Britney Spears here... so any thoughts? [Mark Varney] Britney and I are collaborating on a shred CD as we speak....How did you know? [Truth In Shredding] LOL, seriously???!!! 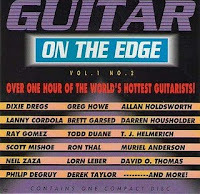 [Mark Varney] All kidding aside, I think some of the GOTE CD's, due to their diversity, would be fun to have. Also, a few Boston Pops and Cincinnati Pops CD's. I find they have more staying power for me than just about anything. But you are talking about the best music ever written, played by two of the absolute best orchestras. As an aside, I guess you know one of my former artists, Jon Finn, has played guitar for the Boston Pops for several years now. [Truth In Shredding] Yes I have been following Jon Finn and super tapping guitarist Don Lappin for some time. Of course I have John Finn's Legato release Don't Look So Serious (Legato Records 1994). Both are Berklee based and both great guys...I have a lot of time for them. If you are like me, you're still looking for the next big guitar player. Do you think that we are likely to find the next Shawn Lane or the next Allan Holdsworth, some cool undiscovered players pushing the boundaries of guitar? [Mark Varney] I just sort of got back into the hunt, so to speak, so haven't heard everyone out there that fits that description. Having said that, in order to take what those guys did to the next level would be an almost insurmountable task. But I won't be surprised if such a player emerges. I mean, after Jack Nicklaus, there was Tiger Woods, right? [Truth In Shredding] ... correct, and what you are saying is after Shawn Lane there must be a new guy or girl maybe... and I guess we are asking the question we all need answering... WHO?! Do you still get the same thrill from hearing a new guitarist or do you have other priorities now? [Mark Varney] Well, I think your last question relates to this one. Having heard some amazing original playing back in the 90s, it is more difficult to be excited when I continue to hear more of the same. But I can still get a buzz from a truly gifted player. [Truth In Shredding] Any guys or girls that stand out for you right now? [Mark Varney] Its hard to remember names as most of them are outside the U.S., but OSV has some stellar players and they told me they got the idea for their concept from listening to my stuff so that was heartwarming. There was a guy you posted yesterday, Niko Tsonev, that briefly unleashed some pretty frightening lines. I need to hear more of him. I know there must be tons more. It seems great players are coming out of the woodwork nowadays. [Truth In Shredding] Yes those OSV CD's are well produced and have some great guitar players like, Mathias Holm, Paco Hernandez, Jonas Tamas , Marcel and Gianluca Ferro amongst others. I think when I set out I thought my blog would have maybe 40 players, but it must be over 1500 by now and 15000 posts... and there are guys are from all over the globe...each country seems to have it's pool of amazing players! The job of finding the cream of the cream just got tougher! Plus the material players are producing without access to a studio is often times phenomenal. Which brings me on neatly to a new subject. With the advances in technology, do you think that the ability for guitarists to record professional sounding CD's at home on computers with no outside input (ie a producer) is a good or bad development? [Mark Varney] It is an overall good development in that it helps them get their music out to a wider audience on the Net. However, these home-produced CDs are rarely as much fun to listen to as those that sound like a band was playing together in the studio. Also, the home equipment often pales in comparison with what can be found in a commercial studio. I also tend to think a professional engineer and producer is often able to get a better overall sound, and, too often, home recordings don't have an authentic drum sound. But if the guitarist is great, home recordings can still be pretty inspiring and sometimes a professional studio with a clock running will intimidate a young player and his demo will end up sounding better. [Truth In Shredding] Absolutely...it's really important to get a great drum sound and no matter how you try to record it with computer drummers it just does not feel real. Although I do have a soft spot for Shawn Lane's Powers of Ten, which features keyboard drums. This might seem an obvious question but what is your view on the whole illegal file sharing and downloading of music? [Mark Varney] I'm not certain if it is overall bad or good. Certainly, file sharing has helped relatively unknown artists get well known fast. But I would think it does cut into sales for established artists. Ultimately, the artist and record companies should be able to control what happens to their music and with file sharing, this isn't the case. [Truth In Shredding] I know for me I got far more pleasure out of stuff I worked hard for than I did from free things. It's an extra bond with an artist...this is really extremely relevant to the smaller players, whose very livelihood might depend on sales from CD's and the interest that attracts. What are you doing now? Any plans for reviving GOTE? If so, any standout players you have heard lately that could be candidates?? Could that lead to future MVP releases? [Mark Varney] At the moment, I am designing superheroes and doing animating and song writing for a motivational speaker. [Mark Varney] Unlike Mike, who made a career out of music, I have spent most of my professional time as an educator, from which I have recently retired. I hope to make the GOTEs and some of my other recordings available again, soon. And I definitely am interested in more GOTEs and MVPs, as they were the most fun of all my projects to produce. Money is always a limiting factor so we will see what transpires. I have only begun my search so it would be premature to mention any definite names. [Truth In Shredding] Keep me in the loop if you're looking for any names. [Truth In Shredding] I had better start looking then... Seriously Mark, I would like to take this opportunity to thank you for giving us such great music, showing us so many great new players and for spending time with Truth In Shredding on this interview. [Mark Varney] Thanks. It was fun remembering those experiences. Thanks for keeping the virtuoso guitar fires burning! awesome interview i love it! Mark, Mike: how about releasing some more Shawn Lane material either from his previous bands which I know for a fact have been professionally recorded but have never seen the light of day or some classic performances from Powers of Ten. I'm sure his previous band mates including Barry Bays and Sean Rickman have loads of material that would be amazing to hear and see released. All the best. I have to agree, it would be great to be able to buy his unreleased music.